Friendship Tea: Giveaway, Your Choice! Well, I already have the red ones, so I won't enter the giveaway. They really are so cute! I just have a little warning and that is that the plastic stoppers in the bottom are pretty flimsy (in mine anyway), so that if you slide them across a surface, the stopper comes loose and you end up with a little pile of salt or pepper! I just bought some corks and cut them to fit. Problem solved! So cute! Either color would be great. Thank you for the chance to win. I really enjoy following your blog. 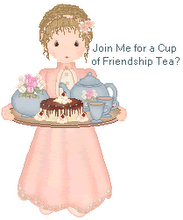 I always feel as if I've attended a beautiful tea party after reading each new post! Thank you for the chance to win a cute teapot s/p shakers set. Red would be my choice, but I'd be happy either way. Something every tea lover needs! Please enter me for the white pair. Thanks for your generosity and have a great week. How cute! If your generous giveaway is open to Canadian residents, I'd love to be entered for the red set. My e-mail address is on my profile page. Thank you!